Arrival in Sofia – the capital of Bulgaria. Accommodation and overnight in Sofia. Sightseeing tour of Sofia – a city with 7000 years long history, concentrating numerous cultural and historic monuments from different periods. Visits of the Alexander Nevsky Cathedral, the St. George Rotunda from the 4th century, the St.Sophia Basilica, the Ruins of Serdica. Overnight in Sofia. Continue to Plovdiv – a city ranking second in importance after Sofia. Overnight in Plovdiv. Departure for Kazanlak, the capital of the famous Valley of Roses. Visit the recently discovered Thracian golden treasures in Kazanlak Historical Museum. Continue with one of the UNESCO’s sites – the Thracian Tomb dating back from the 4th c.BC. Visit the replica of The Thracian Tomb. Departure to the town of Tryavna via the historical Shipka Pass. Walking tour of Tryavna, where vaulted stone bridges, houses, churches and square with a clock tower preserve the spirit and talent of the artists from Tryavna School of Art from the 17th century. Visit the Woodcarving Museum of Tryavna. Continue to Veliko Tarnovo. Overnight in Veliko Tarnovo. Sightseeing of Veliko Turnovo, including a walk on Samovodska Charshiya – traditional arts and crafts street and visit to Tsarevets hill – an impressive sight with the ruins of medieval fortifications. Departure to the museum town of Arbanassi boasting a genuine gallery of religious art in its Church of Nativity. Visit Konstantsalieva house – fine example of 17th century house of a wealthy merchant. Overnight in Veliko Tarnovo. Departure to Madara to marvel the famous Madara Rider carving high up on a 100 meter high cliff, a listed UNESCO World Heritage site. Continue to Sveshtari Thracian Tomb also a UNESCO monument with its painted murals and carved wall figures. Continue to Russe for a city walking tour in one of the key cultural and economic centers of the country and the seat of Bulgarian shipping in the beginning 20th century. Dinner and overnight and Russe. Depart to Ivanovo, a World Heritage complex where we will admire the famous medieval rock churches, chapels and cells of monks carved into the rocks overlooking the Lom river. Visit the main church. In the afternoon departure to Bucharest. Dinner and accommodation in Bucharest. In the morning panoramic sightseeing tour of Bucharest, then departure to Curtea de Arges, former capital of Wallachia. Visit the Episcopal Church where the Romanian Kings are buried. Lunch en route. Drive along the picturesque Olt Valley to Cozia Monastery (visit) and Sibiu, one of the oldest towns in Transylvania – formerly Hermannstadt – founded by the Saxon colonists. Guided walking tour of the medieval town (the Main Square, the Evangelical Church, the Liars’ Bridge etc.). Dinner and accommodation in Sibiu. Morning drive to the heart of Transylvania to visit the secret retreat for the royalties of Europe. The Saxon villages display a remarkable, unspoiled harmony between people and landscape. Visit the village of Valea Viilor and discover the impressive fortified church. Drive on to Sighisoara, birthplace of Vlad the Impaler (“Dracula”). Visit the medieval citadel (the “Upper Town”): the Clock Tower, the Church on the Hill etc.) Dinner and night in Sighisoara. After breakfast, continue to Targu Mures – visit of the elegant city center with the well known art nouveau cultural palace. Drive on to Bistrita – one of the 7 main medieval towns of “Siebenbürgen” (the German name for Transylvania). Continuation through Tihuta Pass. Typical dinner and accommodation at Sucevita. Full day in Bucovina – land of the unique painted monasteries belonging to the UNESCO World Heritage. Visit the Moldovita and Sucevita monasteries with outside frescoes. Lunch en route, then visit the famous monastery of Voronet, “the Sistine Chapel of the Orient”. Late afternoon drive south to visit the Agapia monastery. Dinner and accommodation in a 3-star hotel in Piatra Neamt. Departure across the mountains to Brasov through the spectacular Bicaz Gorges – the Red Lake – Miercurea Ciuc. Lunch en route. Visit the beautiful fortified church of Prejmer. Late afternoon arrival in Brasov, a medieval town from the the early 12th century, enjoy a panoramic sightseeing and guided walking tour. Late afternoon arrival at Poiana Brasov, a popular hill side resort with marvelous vistas in a pine forest. Check-in at the hotel. Dinner and overnight. Departure to Bran for a visit to “Dracula’s Castle”. Drive across the mountains to Sinaia. Lunch. 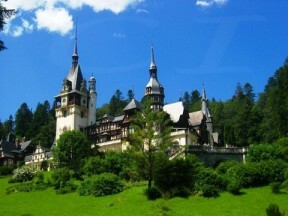 Visit the Sinaia Monastery (1695) and the fabulous Peles Castle – former summer residence of the Royal family. Late afternoon drive to Bucharest. Upon arrival visit the outdoor Village Museum. Farewell dinner in a typical restaurant. Accommodation in a 3-star hotel. • All Bulgarian and Romanian taxes.